With all eyes on Cairo, Egypt today, here's a book written some years ago (1995) that might help us introduce the city to children, followed by links to some discussion guides. Any suggestions for new titles of fiction set in contemporary Egypt? From Publishers Weekly: In this admirable introduction to life in an alien culture, readers are whisked to the busy streets of Cairo—where young Ahmed is making his daily rounds on a donkey cart, delivering large canisters of butane gas. The city is presented through his eyes, and text and illustration work together in harmony to produce a sense of place so vivid that readers can almost hear the cry of vendors in the crowded marketplace and feel the heat rising from the streets. 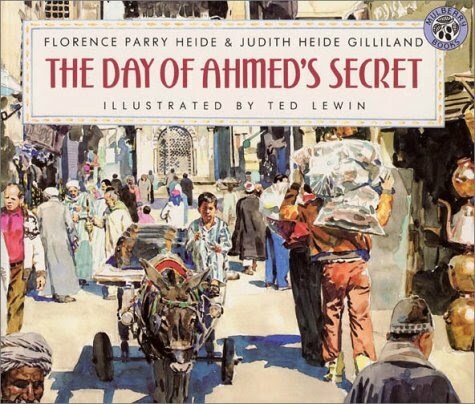 On this particular day, Ahmed carries a secret with him (he has learned to write his name in Arabic), one children will enjoy trying to guess. The authors have produced fluid prose, and Lewin's sensitive, luminous watercolors hint at the mystery and timelessness of this exotic city. Ages 6-9.